March Fools XII Tour – New Leaders, Same Great Rides! Mark & Maria Tebbutt are taking over for Bruce & Marilyn Dewey who led these popular rides for years. Day 5: #1 SF Ferry Bldg – Take the Vallejo Ferry & ride back to Davis. #2 SF Ferry Bldg – Take the Ferry to Jack London Square and then Amtrak to Davis. #3 Take BART from SF Embarcadero Station to Richmond and then Amtrak to Davis. SAG van provided, participants asked to share driving. Etna Tour – If you like Weed, you’ll love Etna. Maria and Mark Tebbutt are returning to Etna for another weekend in the mountains! If you like Weed, you’ll love Etna. Etna, population 700, is a city in the Scott Valley area of Siskiyou County, about 4 hours north of Davis. 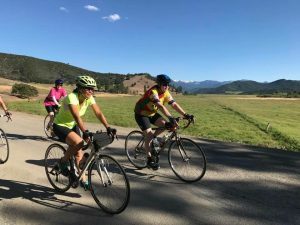 This charming town features two brewpubs, the new Denny Bar Co. Distillery, Bob’s Ranch House, Dotty’s Korner Kitchen for milkshakes and burgers and the South Fork Baking Co.
Our 3-day, 2-night bike tour is a lot of bang for the buck. The Etna Motel is modest and clean and we’ve reserved all 10 rooms. Friday afternoon: Ride 34 miles — A scenic loop ride with adult refreshments in a funky bar. Saturday: Ride 50 miles through the countryside and along a beautiful river. #2 A nice flat ride around town and coffee. There is no SAG support. Tour cost is $120/person for 2 nights (based on double occupancy). Contact: Maria & Mark Tebbutt, funmaria@sbcglobal.net or (530) 753-1125. August 23 to September 3, 2019. Barry Bolden will lead a self-guided tour of Western Ireland. Google “Wild Atlantic Way” for stunning photos of the area. The tour is open to a maximum of fourteen riders. Very few spots remain. Either contact Barry directly at olliebee57@gmail.com or hope that he still has spaces available at the February DBC membership meeting. The West of Ireland exudes beauty and romance like nowhere else in Ireland, with truly spectacular, diverse environments, shorelines, ancient sites, quaint towns and villages and numerous, fascinating activities all there for you to explore. ICT’s self-guided 10-day bike tour includes West of Ireland highlights beginning in County Clare with it’s ancient, historical sites, the Burren with is unique and beautiful limestone landscape and the famous Cliffs of Moher, the glorious harbor city of Galway, where you have the option to do your own day trip to the Aran Islands’ Innis Mor, or spend an extra day in and around Galway city, Connemara’s diverse and breathtaking landscape, including Clifden’s Sky Road, the beautiful Kylemore Abbey, spectacular Delphi Valley, the gorgeous Twelve Bens, picturesque Killary Harbor, breathtaking Croagh Patrick, the picturesque town of Westport, County Mayo, and lastly, the charming village of Cong made famous with the filming of the 1952 Oscar winning film with John Wayne and Maureen O’Hara, “The Quiet Man”. ICT’s self-guided 10-day bike tour route accommodates all levels of cyclists, with easy to navigate terrain with some low rolling hills. The tour includes; Lodging for 10 nights and daily breakfasts in selected guesthouses, B&Bs and hotels, Luggage transfers, break down service, and detailed itinerary and route maps. Any bike boxes can be safely stored until the end of the trip. Day 3: You will cycle to the lovely, musical town of Doolin. You’ll visit the spectacular Cliffs of Moher, and listen to traditional Irish music at the local pubs. Day 6 You have the option to take your own day trip to Aran Islands’ Innis Mor, or spend an extra day exploring in and around the environs of Galway city. Day 7 You’ll cycle out of Galway city and head to the vibrant, lovely town of Clifden, on the Connemara coast. Day 10 You cycle to your final destination, the delightful, scenic village of Cong. To guarantee your reservation a booking deposit of $250 is necessary by February 11, 2019. The total 10-day trip cost (with $250 deposit) is $1500 (excludes bike rental, optional Aran Island day trip, single accommodation supplement, lunches and dinners). WAIT LISTED. September 13th to September 15th — 3 days/2 nights. Here’s a chance to break new ground. A chance to see new sights and lose yourself in the backroads of Plumas County. Mark and Maria Tebbutt are going to explore the area near Lake Almanor with future trips in mind. However, for a small, lucky bunch, the future could be now! Join the Tebbutts on a journey of discovery to create a new DBC bike tour. You’ll check out motel accommodations, potential riding routes restaurants and drinking establishments. The Tebbutts are seeking 2 – 4 adventurers to help them in this exploration. You’ll be staying at a modest motel in Greenville and will have the thrill of riding near Chester. Estimated lodging cost per person is $125 for two nights (based on double occupancy). We did say it was a modest motel. Contact: Mark & Maria Tebbutt at funmaria@sbcglobal.net or (530) 753-1125.